Natural modulators of protein kinase CK2 activity might be divided into two groups. Substances of the first one, polycations, like polyamines and polylysine are able to stimulate enzyme activity. On the other hand, compounds like heparin (polyanions) have inhibitory properties towards CK2 activity. The sequence of Asf1 possesses five potential phosphorylation sites for CK2, but it seems that it does not underlie phosphorylation. Yeast Asf1 amino acid sequence contains a characteristic acidic fragment at its C-terminus. Such a sequence, called pseudosubstrate region, of regulatory subunits is present in several protein kinases, like PKA and PKG, and can be also found in the regulatory subunit of CK2. 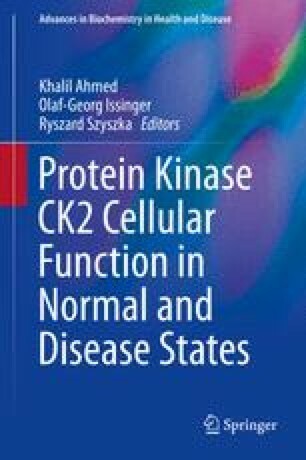 Experimental data suppose a modulating effect of Asf1 towards protein kinase CK2 in a different manner when comparing the influence on each catalytic subunits itself as well as the corresponding holoenzymes.